don’t be a rule breaker like us! the NUMBER ONE question we get asked time after time is about how ella flies and how they can fly with their dog. when we first decided we wanted to try bringing ella with us on vacation, we picked miami, a short 2.5 hour flight. we decided if ella wasn’t happy, it was a short enough flight that we could comfort her and get on and off the plane pretty fast. ella also had the ‘right’ personality to try out flying. she is a generally chilled out dog, unphased by much. she doesn’t have separation anxiety and she already had a great relationship w her travel bag from our trips back and forth from dc. so, how can YOU fly with your dog? 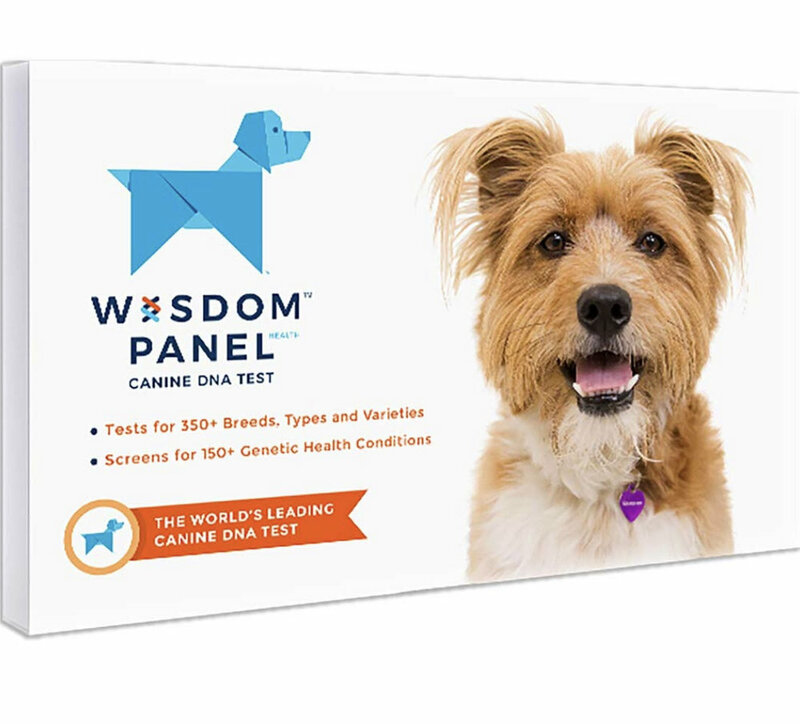 asses his or her personality: is your dog high strung? does your dog get excessively stressed in new situations? is your dog too big to fit under a plane seat? if the answer to any of these questions is yes - flying may not be right for her. choose a travel bag & make it your dog’s bff: we use a sherpa airline approved travel bag that is closed on all sides. some dogs need more ventilation, but ella gets chilly and likes to snuggle into the shearling bottom and starts shivering if we lift the flaps mid flight. you should start with training your dog to go into the bag using a lot of treats and getting her comfortable with closing the bag. once she’s ok being zipped into her bag, start testing traveling varying distances, starting with short car rides, and ideally working your way up to multi-hour road trips. your dog should be OK to spend more than a few hours zipped in before you attempt to fly. we also pack the side storage with some of ella’s must haves: buffalo jerky twists, a collapsible water bowl, a few pee pads in case of delays. if your dog has a favorite toy, include that too! find and learn the rules! all airlines have different rules about pet travel and you should make sure you familiarize yourself. for domestic flights, as a general rule, if your pet & carrier fit under the seat in front of you, you can purchase a ticket and fly without much issue. as a general rule, less than 20lbs including the carrier is allowable. before you purchase your flight, call the airline and ensure they still have room. many airlines limit how many pets can be on a flight. you will need to have a veterinary issued health certificate that shows your pet is up to date on her vaccines. keep this on you! international travel: this will be it’s own post, but for now, know that you need to make sure your veterinary paperwork complies with your destination. not all locations will accept pets, for instance australia and new zealand. do your research! check out our milan travel diary for details on international travel. If you book your flight online and the actual plane is being operated by a different airline carrier, you may not be able to book a pet ticket. make sure if you are flying Delta for instance, that the flight is operated by Delta and not a partner. often, it’s best to book on the airline’s website directly so you can have the best customer service. get to the airport an extra hour early. you can’t check in online if you are flying with a pet, so you’ll need to allow time to wait in potentially long lines to check baggage and get your boarding pass. scope the airport in advance for pet amenities. jfk in new york has pet relief areas in most of the terminals. we always leave time to hit that up before boarding so ella can get a potty break after braving security. get naked. did you know your dog can’t wear a jacket when you go through security? true story. some agents require the dog not be wearing any clothing. in effort to be prepared, we put ella’s warm travel sweater on AFTER security. note that all charges are PER FLIGHT and not round trip. contact delta to double check max carrier size prior to flight, certain planes have smaller requirements. your pet counts as a carry on - you will need to check additional baggage. 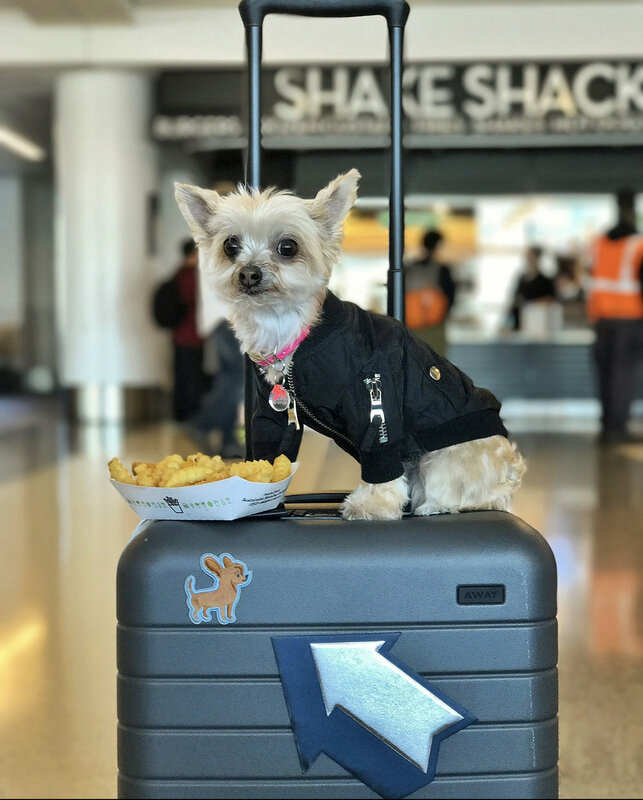 one of the pet friendliest airlines, jetblue has it’s own JetPaws program where frequent fliers can earn 300 points per pet flight! pet carrier cannot exceed 17"L x 12.5"W x 8.5"H and the combined weight of your pet and the carrier must not exceed 20 pounds. United allows the pet and a carry-on bag, which is unusual! fries before bean flies. always. 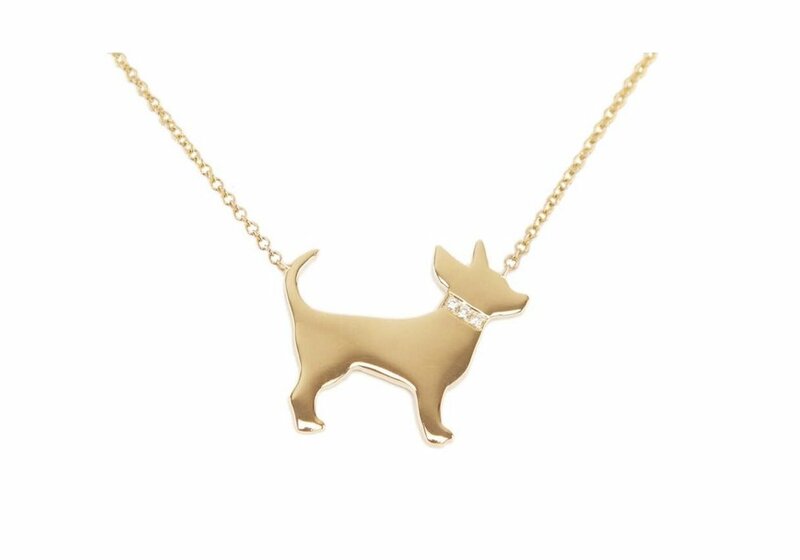 perhaps you’re a dog shopping for your beloved human. or perhaps you are a human shopping for a pet loving human that you love. that’s confusing. regardless, if you are here, you might need some gifts. here are the bean approved gifts for humans this holiday season. paris: hotel montalembert is a pup friendly, chic boutique hotel on the left bank. includes a pet bed and bowls and friendly staff. perfect location for a home base in paris. south of france: villa la coste is literal heaven if you love food, wine & art. your well behaved dog is welcome everywhere (except the spa) including their michelin starred restaurant. ella was treated like a princess & this is on our hit list of places we can’t wait to return. the nearby town of aix-en-provence was also incredibly dog friendly & so picturesque. pro tip: dogs are allowed almost everywhere, but if there is a NO DOG sign, be respectful! venice, italy: hotel danieli is right on the grand canal and footsteps from the dogue palace & st marks square, this opulent hotel included a luxe dog bed, bowls and special treats. dogs aren’t welcome on the roof or restaurants, but we found plenty of outdoor seating in venice where ella was welcomed and pampered. portofino italy: belmond splendido is the ultimate in luxury, a canine masseuse and dogsitters are on staff to ensure your pup’s every whim is catered to. Miami Beach, Florida: the standard spa invites well behaved pups to lounge by the pool and greets them with bowls, beds and special treats. the clientele is super cool and for the humans, the hammam is 👌. aruba: the ritz carlton is absolutely perfect and small dogs can access their own mini cabanas and enjoy a dog menu, including poolside frozen watermelon. the water is clear and warm if your pup is in the mood for a dip! bachelor gulch, colorado: another ritz carlton property we had the pleasure of staying at also offered an incredible dog menu, dog massages and fabulous hiking. upstate ny: scribners catskill lodge is a bean fave and we’ve returned multiple times. hiking, relaxing by the fire, eating yummy food and more at this cozy upstate hipster haven. financial compensation was not received for this post, but we thank Ritz Carlton for the gift of an incredible stay. opinions expressed here are my own. when the ritz carlton reached out to invite us to stay at their bachelor gulch resort in colorado, we jumped on the opportunity. we loveeee it in the catskills, so we knew heading to the real mountains out west had to be even more gorg. we totally underestimated how beautiful it was going to be. the mountain air is crisp and clean. the views are insanity. the mountains are dotted with wild flowers and lush trees. the clouds looked like a painting. the resort itself is actually a massive log cabin - the largest in the usa! the property is one of THE most dog friendly resorts we've ever been to. not only are there specialized canine dining options to be ordered, there's awesome hiking, the rooms come stocked with a comfy bed, bowls and treats and my personal fave: a certified canine masseuse. dinner overlooking the mountains? yes please. what made the trip extra fun: we were invited to the ritz with some friends, both new and old. we were joined by chloe the mini frenchie, tuna, of tuna melts my heart fame, popeye the foodie, cooper the frenchie and the dogist. we had the opportunity to try all of the dining options. dinner at buffalo's was awesome, but the standout was the dessert: a cast iron baked cookie, smooshy in the center with ice cream on top. omg. while i may love my fashiongirl lifestyle, i also enjoy a good romp in nature. we took a hike to anderson's cabin, original home of John Anderson, one of seven bachelors who settled the gulch in the early 1900s. the cabin is meant for private dining experiences and has incredible mountain views. the resort also brought their canine masseuse to the cabin to ease our aching muscles after our hike. yessss, that's the spot, that mr. massage man. lady human's favorite meal was at wyld, which is is a more foodie forward take on alpine cuisine. she did share some of her meat with me, which was amaze. we got a little carried away discussing human dining options - because the chef has also carefully designed a canine menu, which is far more important to me. i sampled every option - my fave was the german shepard's pie which comprised of local lamb meat, veggies and rice. for those who prefer steak, chicken or an eggier dish, there are meal options including those proteins too. in the evenings after a day of hiking and eating (or skiing in the winter), the guests gather 'round the campfire, look out over the mountains and soak in the amazing sky. as a new yorker, i can't remember the last time i saw so many stars. what we loved most (aside from eating) is that the resort is really designed to be enjoyed year round. lady human and i had thought of colorado as a winter destination, but the summer was stunning. the weather was awesome in august. we would LOVE to go back and experience it in the snow. the human spa is AMAZING with a grotto pool to swim in underground, steam room and more. nature hikes in the summer/ fall will become skiing and snowshoe-ing. we'll be back, bachelor gulch! lake como was an easy 50 minute train ride from milan. we opted to make the town of bellagio our home base so we'd be centrally located during our stay. we found some amazing food and had a blast exploring the lake. here's the bean guide to a dog friendly trip to lake como! originally a vacation home for a 19th century aristrocrat, the grand hotel villa serbelloni is opulent in every single way. the hotel is set within incredibly beautiful gardens (perfect for pup walks) and inside, murano glass chandeliers mirrors, tromp l'oeil, incredible frescos and gold trim make you feel like you are inside a palace. the service was impeccable. the pool overlooking the lake is gorgeous and there are even buttons located around the property to call for service if your wine glass needs a refill. when wandering around the property, you might walk past suites named for famous past guests, like the jfk suite. plaques give a little bit of history about the suites and when / why they got their names. we spent a morning in the town of como, which was great for shopping, site seeing and for a beautiful church (according to the humans, no pups in the church, RUDE.) we had one of our most memorable meals of the trip at the market place. not only is this upscale, contemporary resturaunt welcoming to smaller dogs, the humans said the food was incredible. i managed to score some prosciutto and house made bread. expect a 'foodie' experience with unexpected serving methods (tartare in a wafer 'cone'), flavor combos and more. if ever in the como area again, we'd absolutely go back. varenna is a little town across the lake from bellagio, where we stayed, making it a convenient short ferry trip if you want to have dinner in another town. another top meal memory from our trip, we dined outside and had another great meal with local cheeses, meats, and of course pasta. man human shared some of his lamb with me and i was not disappointed. the food and wine were excellent. rent a boat! no, seriously. you don't need a boating license (i <3 italy) - man human found a boat rental company on trip advisor and arranged for us to spend an entire day boating around the lake. we brought snacks, water and a map and had the greatest day floating around, exploring the towns and villas from the lake. lady human and i were skeptical, but it was a highlight of our entire trip.